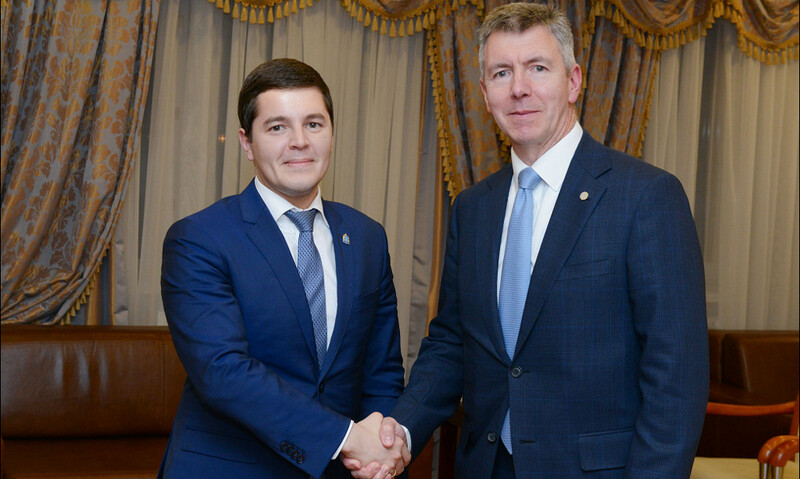 The meeting of the governor of Yamal-Nenets Autonomous Okrug Dmitry Artyukhov, the head of BP Russia David Campbell and the director general of “Kharampurneftegaz” (a joint venture of the oil company “Rosneft” and BP) Sergey Slichny took place. They discussed important issues, including production activity of “Rosneft” and BP on the territory of Yamal. Fulfillment of the project on development of Kharampurskoye field is among the priority directions. “We planned construction of the railroad line (the Northern Latitudinal Railway) in the area of your coordinates. This is major infrastructure that will allow developing extractive fields much faster. And leading of the railroad line to Sabetta (the Northern Latitudinal Railway 2) is the next project that we shall undoubtedly launch. Already quite other interesting opportunities, up to processing, appear there. Because the export channel both to the west and to the east will appear in our region super-rich with resources”, said Dmitry Artyukhov. David Campbell notes that this is a brilliant prospect. According to him, not only Russia will be proud of this project, it will be known all over the world. “Kharampur is our largest investment in the region”, he says. It is fulfilled within strategic cooperation with “Rosneft” in the sphere of gas. This is the biggest investment in five years. He hopes that the company will continue working here for many years. And this is not just investment cooperation, the talk is about creation of a joint venture, as he says. Sergey Slichny told about the plans on development of Kharampurskoye oil, gas, condensate field. According to him, the project involves development of traditional gas reserves of the Cenomanian deposit and experimental-industrial exploitation of the Turonian deposit with subsequent transfer to full-scale development. “The total gas reserves for the present day make about 880 milliard cubic meters in Kharampurskoye and Festivalnoye license areas. The bigger part of extraction, the main profile we have falls on Turonian gas. In other words, this is our second phase in fulfillment of this project. As for the first stage of implementation — the Cenomanian project, currently active construction of infrastructural objects and a gas pipeline of external transport — 150 kilometers from Kharampurskoye field to the unified oil and gas system is being conducted now”, said the director general. Also the so-called zero phase, driving of piles for future infrastructure, is being conducted. In parallel, delivery of equipment is being fulfilled. During the discussion the governor of Yamal told about construction of transport and social infrastructure on the territory of presence of the joint venture “Kharampurneftegaz”. According to the press service of the head of the region, in particular, the talk was about development of the town Gubkinskiy. “There is already good infrastructure here, but we shall add children’s institutions: two kindergartens and a school. We shall build housing and sports objects, including a hockey rink. And then our small town Gubkinskiy, the youngest city in Yamal, will become even better”, said Dmitry Artyukhov. In 2018 BP closed the transaction on acquiring a 49% share in the capital of “Kharampurneftegaz” (51% owned by the company “Rosneft”). The joint venture “Kharampurneftegaz” was created to develop Kharampurskoye field in Yamal-Nenets Autonomous Okrug.